Looking for an easy craft to do for St Patricks Day? Check out this “Rainbow with Pot of Gold Chain Craft” we made! This fun, colorful decoration looks great in our playroom. Begin by cutting red, orange, yellow, green, blue, and purple strips of construction paper. Cut out yellow circles for the gold. Glue the yellow circles together and glue it to the top of one of the black pots. Staple the pot handle between the two black pots by slightly twisting it to loop through the rainbow chain and connecting to the other side of the pot. After that, we put some glue on the yellow circles and sprinkled gold glitter. Lastly, we tied some string to the top and hung it up in the playroom! Check out our other fun, St. Patrick’s day crafts for kids! If you do decide to make this craft or any of our crafts. We would appreciate it, if you can share a picture on our Facebook page. We would love to see how your art projects turn out! 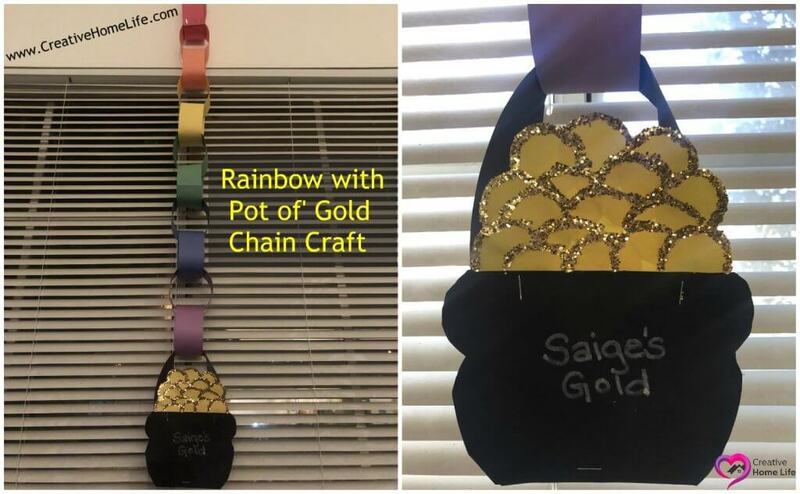 If you have any questions about our “Rainbow with Pot of’ Gold Chain Craft”, or anything else… Please feel free to message me or leave a comment.